The mission of Innovative Energy Saver (iESaver) is dedicated to being at the forefront of the Green Energy initiative by marketing the PowerHouse, a reliable, efficient, cost effective, energy saving product. The PowerHouse reduces electric bills, repair bills, maintenance costs, extends equipment life as well as being a friend of the environment by reducing the carbon footprint. PowerHouse is backed by a US Patent (8971007) that encompasses the unique wiring configuration that gives it the ability to bring to the table its many positive features. 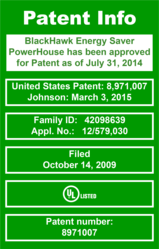 In addition to the US Patent, PowerHouse is also UL Listed by Underwriters Laboratories confirming the rigid independent third party testing that it has been put through in order to achieve this much sought certification. The PowerHouse Energy Saver, manufactured by Innovative Energy Solutions & Services, marketed by Innovative Energy Saver is rapidly proving itself to be exactly what Jerry Johnson envisioned when he assembled the prototype unit in 2008. By making more effective use of the electricity that you pay for, Jerry developed a technology that enables customers to realize substantial savings on their electric bills as well as seeing reduced repair bills, maintenance bills, longer equipment life and significant reduction of their carbon footprint. All of this is explained by Mark Ware in PowerHouse, an explanation of the science of the PowerHouse written in layman’s words. Mark’s simple yet effective explanation enables anyone to understand how it works not only for the customer by saving money but also for the utility as it reduces grid demand as well as the environment by reducing the amount of carbon that is produced and released via green house gases. The Power House is protected by a fully executed US Patent and it has the distinction of being UL Listed by Underwriters Laboratories. Voltage is boosted and stabilized, minimizing low and fluctuating voltage issues. By boosting the voltage, amp loads are lowered, reducing heat and friction within motors, resulting in lower operating temperatures. All three legs/phases are balanced, facilitating equipment operating at its optimum design and peak efficiency with increased productivity. Power Factor is corrected when the PowerHouse harnesses the lost power that goes to ground and brings it back into the system, enabling the customer to more efficiently use the power that has already entered the electrical system and been logged thru the electrical meter. The stabilized voltage provides the steady, dependable power needed to power computers, data centers, pumps, motors and lighting. The PowerHouse provides 50,000 volts of added surge protection, which is critical for protecting computers, pumps & motors. Kilowatt consumption is reduced, thereby reducing the volume of CO2 gases that are generated. Electric grid demand is lowered, so less coal, oil and natural gases are required, paving the way for us to become a more energy efficient nation and less dependent on foreign sources of fuel.